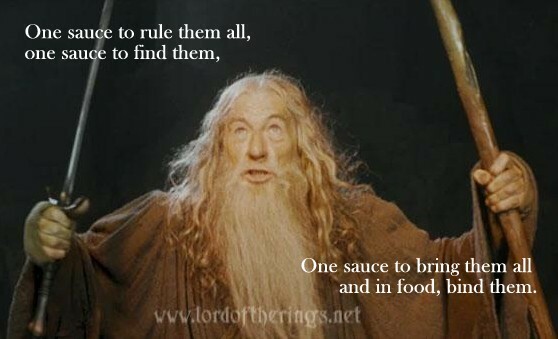 Awesome sauces class this Saturday for the art of seduction – I mean, sorcery. I mean, saucery. The world needs sauces or else life would be extremely boring. One has to wonder though, what are sauces good on? If you did not pick 6 then perhaps you need to get schooled in the art of vegan saucery. 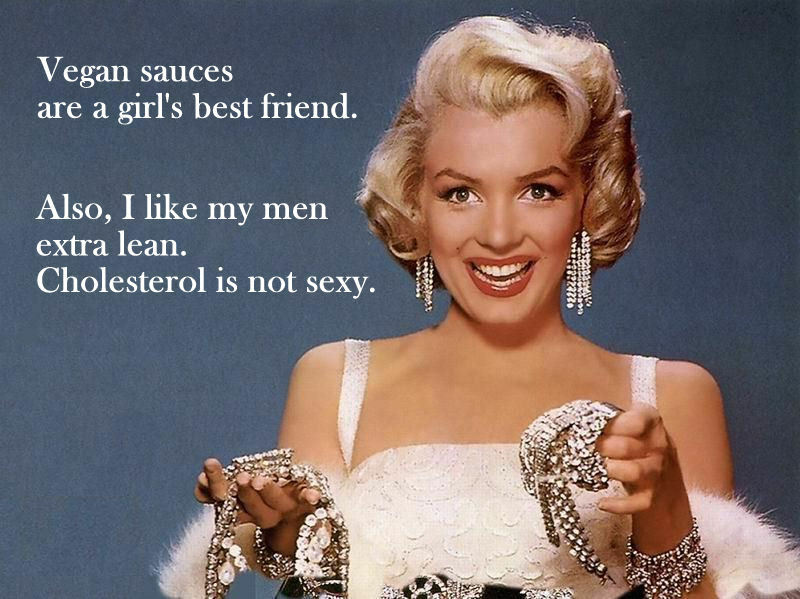 And I’m not talking about how to become Gandalf or Marilyn Monroe – although I daresay you can add magic or seduce anyone with a truly flavorful sauce that will elevate your dish of choice from meh to amazing. Even if you did pick 6, let me ask you this – are the sauces you currently make as healthful as they are tastebud-tantalizing? ‘Cause you don’t want to induce a heart attack when you’re licking a spoonful of (insert favorite sauce here). This Saturday, join me as we explore the world of plant-based Awesome Sauces and apply said sauces to a number of dishes. Why awesome? Well, see multiple choice test above + the fact that once you know these master recipes, you can apply them to a googolplex number of dishes. Who says nacho cheese sauce is only good for nachos? It’s pretty awesome as the cheese to your Mac and Cheese or as a dip to get the little ones to eat their veggies. Hello, grilled cheese sandwich, anyone? Sour cream – good in a burrito, good as a dip, good as salad dressing. While gravy is always classically paired with mashed potatoes (well in this class, mashed root vegetables because I like living on the veggie edge), it’s great in a sandwich or even with tofu + caramelized onions. Or on a veggie burger! All plant-based, all vegan, all cholesterol-free, all the time. No fakey fakes, only natural stuff. Okay, I should let these sauces speak for themselves. Come to Awesome Sauces class this Saturday the 11th, 10am to 2pm. Learn some kitchen witchcraft and saucy seduction skills. 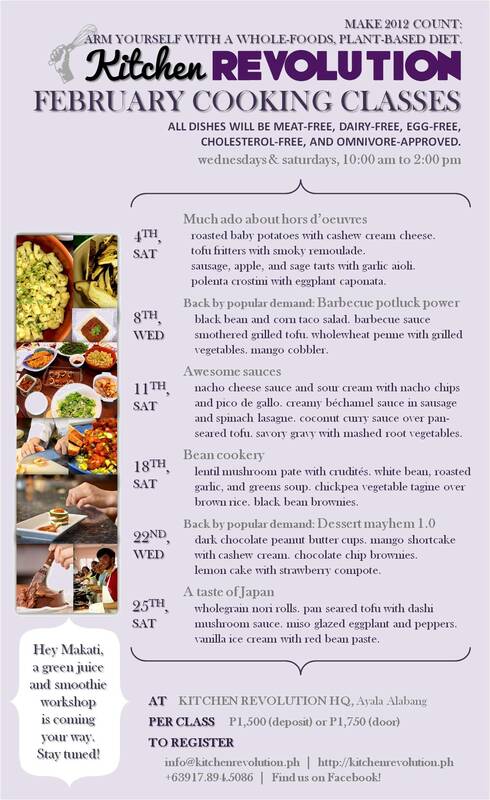 General information on cooking classes here. Cancellation policy on cooking classes here. Photos on past cooking classes here. Schedule of other February classes here. Details on my Makati green juice and smoothie workshop here.